After announcing the recent revamps of the saloon and estate versions of their E-Class, Mercedes now gives the Coupe and Cabriolet versions a once over. The E-Class has a distinctive styling makeover which bins the quad headlamps for a sleeker look. The grille is also bigger and features Merc’s latest ‘propeller-inspired’ look. Among the new additions for this popular car, are powerful and efficient BlueDIRECT four-cylinder engines featuring pioneering injection technology and trend-setting assistance systems. Mercedes calls these ‘Intelligent drive’ because they can help to prevent accidents with other vehicles or pedestrians. There’s also Active Lane Keeping Assist and anti-glare, permanent high-beam headlamps. There’s also a new camera system that monitors what is happening up to 50metres in front of the car. There’s no doubt that the E-Class is a popular choice for drivers and the upgrades make the new cars much better versions of the models they replace. Buyers can choose from a turbocharged 2.0litre, four cylinder direct injection petrol engine up to the impressive 3.0litre V6 common rail diesel unit in the E350. It looks like the larger 4.6litre model has been taken out of the UK market. Buyers of the soft top should be aware that it comes with the firm’s Aircap system which reduces wind buffeting when the roof is down (basically a cap pops up on top of the windscreen at speeds over 25mph to help control the vehicle and then drops when the speed goes below 9mph). There are also otional neck heaters for those who don’t like the chill wind around their heads! 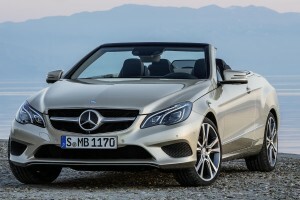 Merecedes-Benz haven’t announced prices for the revamped E Class cabriolet and coupe versions but they should start at around £32,000. This entry was posted in Car Updates & Releases, Executive Cars, Family Car, Popular Cars and tagged Cabrio, caption, car, coupe, e-class, LS, mercedes, Merecedes Benz, new Mercedes, new Mercedes E Class, price, speed, technology, UK by Steve Lumley. Bookmark the permalink.